Start your trip with a Badder Bus school bus rental. You’re looking for a school bus to get your group on the road. School bus travel brings your excited group together to share their journey with one another. When the energy level is high and the only thing on your travellers’ minds is fun, we’re here to help let the fun begin. We started with just 1...today, we have more than 101. You’ve got places to go. We’ve been taking you there for over 65 years. You know your group is our priority. You’ve trusted us for more than half a century to get your guests to their destination. 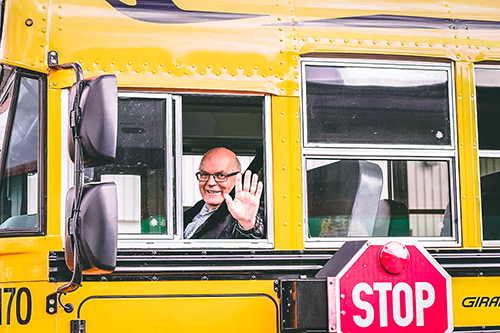 Our reliable and cost-conscious school bus rental in Hamilton, Niagara, Toronto, Chatham, London, and surrounding areas, will get you started on your journey today. We had our final Explore educational outing yesterday with the students. We had three awesome bus drivers who were courteous and professional. We were super impressed and very grateful to them. Please pass our praise along! I wanted to email you about our bus driver, Betty. She is spectacular. We had a student who was having emotional problems. Betty calmed him down, chatted with him, and even gave him some help with his sensory issues. She went way above and beyond. I wanted to share with you the phenomenal experience we had with our driver, Columbus. He was an outstanding addition to our team. He was not just personable, professional and polite - he participated with the students when they were singing, cheering, and getting ready for the Ontario Student leadership conference. We just wanted to make sure we let you know that Columbus really exceeded our expectations! Our school bus. Your journey. Safe and reliable. You’re comfortable.